Click here to view my follow-up interview with Jessica Piazza! 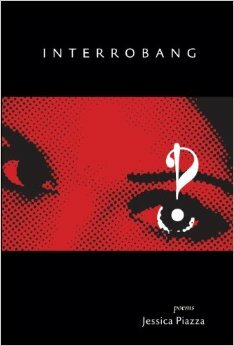 Jessica Piazza’s debut full-length poetry collection, Interrobang, is all at once lovely, inquisitive and complex. I found myself startled by the constant alteration of the persona; the interjection of the phobia and the philia as a backdrop for the persona’s transformation; and Piazza’s mastery of the sonnet form, employed in most of these poems. It was a pleasant deviation by way of theme and form. Before fully launching into my review of Interrobang, I’d like to share one of my favorite poems from the collection, “The Prolific,” which I will then return to throughout my discussion of the collection. each morning, as we passed on 23rd. He’d tell me less is more. I’d say: I’ve heard. in space that couldn’t rift. My eye bereft. foot-pounded down by countless hurried feet. He couldn’t love it. It was not complete. pressed lightly to transparent collarbones. my own imperfect eye could substitute. details I missed would haunt me when I did. too clean of reds, of blues, of orange stripes. This poem is stunning, in the way so many of Piazza’s poems are stunning—they are imagistic, rhythmic, and (perhaps most importantly) internally aware of the changes that inhabit their space, and that inhabit the larger arch of the collection. Because of this, there is an implied conversation that occurs between these poems, drawing attention to the discrepancies that are projected onto the persona or the situation that surrounds her. These discrepancies have very little to do with unreliability or lack of attention to detail; rather, they reflect the impermanence of our humanly situations, as well as the potential falseness of our memories. Much of this collection operates around the complex concept of transformation, which opens doors to, both, longing and our own limitations. Piazza’s poems are complex and require great and consistent effort to gain access. For instance, the first five lines of this poem operated strictly as a series of images for me—until I reached the sixth line, “each morning, as we passed on 23rd.” The simplicity of this detail, placing the persona and this male other on 23rd Street, recast that previous series of images as memories of landmarks along that stretch. This sort of shift in access to images and information is a constant, both in this poem and many others; it represents an opening up that occurs between the persona and the reader, particularly in a poem such as this one, when the final line of one sonnet is revised as the first line in the next, displaying some new truth to the story developed across the “Profilic” series. Though these lines are in reference to the Street itself, it also suggests something greater about memory: how our memory is hardly one large map of instances, but rather is a complex layering of references, reminders and transformed understanding. This idea relates to the larger connection, as well, and the instances in which one image transfigures into another—“a tree where raised / wires ought to be”—or is transposed onto another—“still there / in afterimages, a shadow where / a statue stood.” Both of these possibilities (though one relates specifically to the falseness of memory and the other to the afterimage, or transposing, of memory) further emphasize the impermanence of our surroundings and the longevity of memory, however untrue or changing. Perhaps this suggests something about longing, as well. Often, in these poems, I find the use of memory and the transformation of an image, to relate specifically to a wanting back in, looking for a door that will allow us back into a shared space with a person or object, in the hope that they are the same as we left them. In the second-to-last sonnet, the persona reflects on the absence of one particular man over all others, and these reflections are recast into a meditational longing for what once was there, in the same place and in the same condition. This is a desire I believe we all experience at one time or another—a longing to return to something, or to have that something returned to us, in the here-and-now, somehow unchanged and lacking the memory of ever having been absent. A longing for a lack of change, even. However, we are constantly reminded as readers of this impossibility, due to the constant-flux that occurs in the persona, in the landscape, and in other accompanying figures. We are challenged to understand the demands of change; when one thing changes, it changes everything else, however minimally; and there is no way to regain that object in an unchanged state while remaining in our present. We have to choose; we can’t have both. Though I have focused primarily on “The Prolific,” these sentiments of change, memory and the inclusion of the phobia and philia run deep throughout this collection. I found myself challenged—threatened, even—by the shifts imposed upon the persona and the longing that is so inherent to these poems. This collection threw me back into my own depths, my own grief and fears, and left me cycling-in-place in a way very reflective of the persona: living in the present but longing for things of the past, somehow pairing them together in my mind and losing the realities of what used to be, creating instead an ideology. Perhaps that is why the role of Phobia and the Philia became so important, so remarkable, to me; they not only worked to categorize feelings around loss and longing, but they also represented the positive-negative complication of memory. Sometimes they even functioned as a direct opposition to what is expected—dreading the good memories of something lost, and thriving on the negative, giving us reason to lessen our affection for the lost. Sometimes that’s just how grief works. Jessica Piazza’s Interrobang is a truly-stunning collection that is, at its deepest, heartfelt and frightening to the core, in the way it opens us up and searches through our most-secret parts, our memories, our emotions. It is an emotionally-challenging collection that is imagistic and rhythmic, and it is highly unforgettable. This is a collection I’ll be thinking about for quite some time, especially as I return to some of those old, harder memories and try to transform them into something new, a poem, a piece, somewhere. The longer I think about it, the more I feel this collection expects that from me, as it will expect from others. JESSICA PIAZZA was born and raised in Brooklyn, New York and now lives in Los Angeles, where she has completed a Ph.D. in English Literature and Creative Writing from the University of Southern California. Her chapbook, This is not a sky, is forthcoming from Black Lawrence Press in 2014. You can view more about Interrobang here.